The past eleven days are amongst the busiest in our Church calendar. 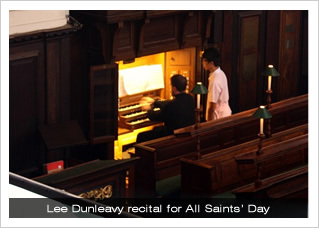 On All Saints’ Day, Thursday 1 November, the Director of Music gave his monthly organ recital, with a programme including pieces on Saints’ Days ... illustrating Saints Paul, Bridgid, Gabriel, George, Asaph, John the Baptist, Christopher, Hippolytus, Michael, Canice, Cecilia, Stephen, Bride and Cuthbert! That evening over two hundred gathered for the High Mass with Procession of the Day. 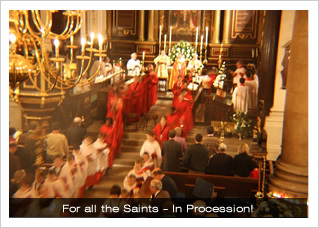 The Processional Hymn was the complete For all the Saints with the addition of our own home verses – fourteen verses in all! Strengthened his brethren when by grace restored. And through thine image, all our people heal. The service concluded with Mr Horden’s stunning performance of the Final from Vierne’s Symphonie No. 1, closely followed by a drinks reception in Church. 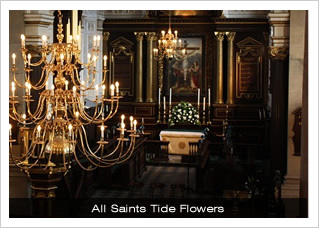 The next day – All Souls’ Day – saw the tradition three Requiem Masses. 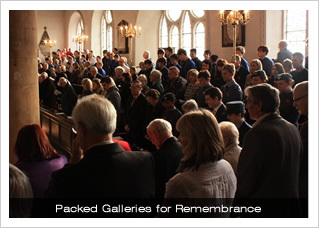 After an early morning said service, the lunchtime service was led by the Boys’ Choir and the All Saints’ Singers. After an afternoon of football and games, the boys returned, joined by the men, to give a liturgical performance of Mozart’s Requiem in the evening. 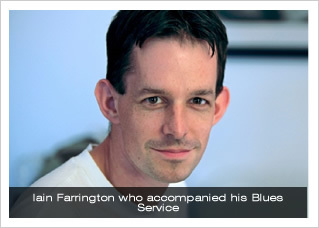 On the Sunday in the Octave of All Saints, the men of the choir had the day off, and the Boys’ and Girls’ choirs combined to perform A Little Jazz Mass in the morning, accompanied by Martin Pickett’s wonderful trio, and Iain Farrington’s Blues Service at Evensong, accompanied by the composer himself. The usual week of services followed – Choral Evensong on Monday, Tuesday and Wednesday, Choral Mass on Thursday and Choral Compline on Friday. 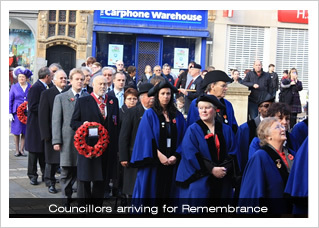 Today we welcomed over one thousand people in Church for the Civic Service of Remembrance, with over a thousand more outside listening to the service via the speaker relay. The Boys and Men performed Ireland’s Te Deum laudamus in F, and Alan Gray’s A Thanksgiving – November 11th 1918. The Girls and Men completed the day with a Requiem for the Fallen sung to the setting by Gabriel Fauré in David Hill’s recent arrangement for organ, harp, violin and ‘cello.